You all know how much I love iced coffee…well, any coffee for that matter. So, last night I hosted a game night and International Delight Iced Coffee tasting for some of my friends. I had so much fun baking, decorating and setting it all up. Then, I got to enjoy the evening with girlfriends! I made this invitation, uploaded it to my cell phone and sent it via text message to my sisters, my sisters-in-law and a couple of friends. They got a kick out of the unique invitation. 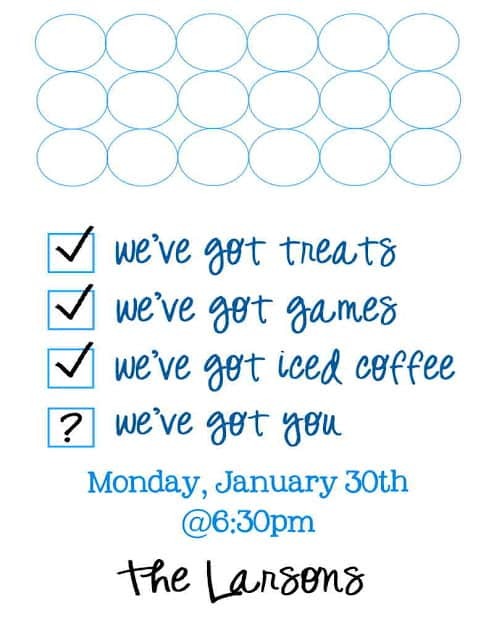 Want to host your own game night and coffee tasting? You can use a blank version of my invitation by downloading it HERE. Once you’ve downloaded it, open the image with photo editing software and add the words. Also, you should call your local Walmart BEFORE driving there to see if you can find the iced coffee. I wish I would’ve had that piece of advice…check out my Google+ Album to see why! I made a painted chalkboard and it became our tally board. 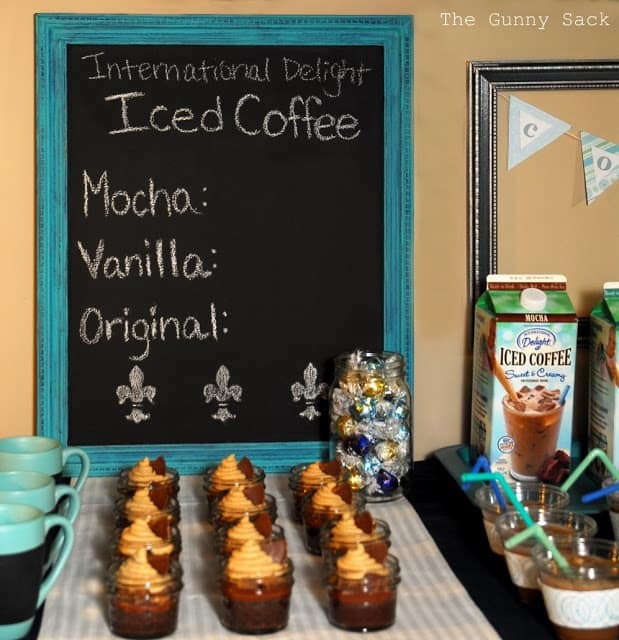 My guests were to try each flavor of International Delight Iced Coffee and then vote on their favorite. I also painted a vintage metal tray to hold the cartons of iced coffee. 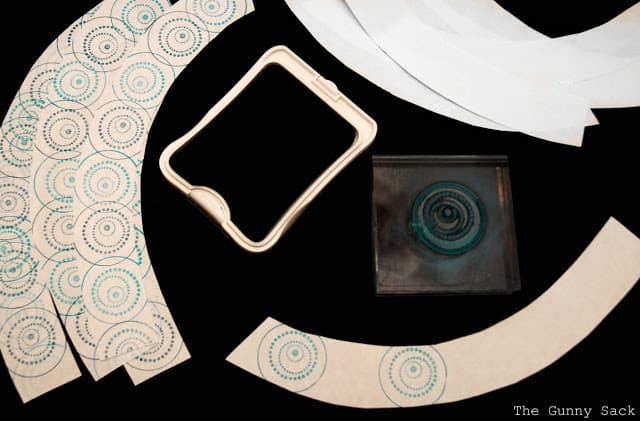 To make cup wrappers, I cut out strips of white paper and stamped circles on the wrappers. I would’ve made some that I could print but my printer isn’t working anymore. I attached them to the cups with Elmer’s Glue Spots. We put ice in the cups and poured the iced coffee over it. I set out bottles of original and chocolate whipped cream, as well as chocolate shavings and crushed peppermint candies to use as garnish. I painted polka dots on ruffled white baking cups and filled them with chocolate drizzled popcorn. 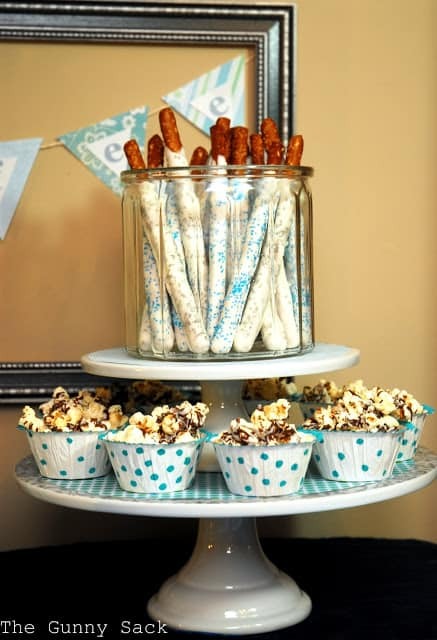 In the cookie jar, I put dipped pretzel rods with blue and silver sprinkles. 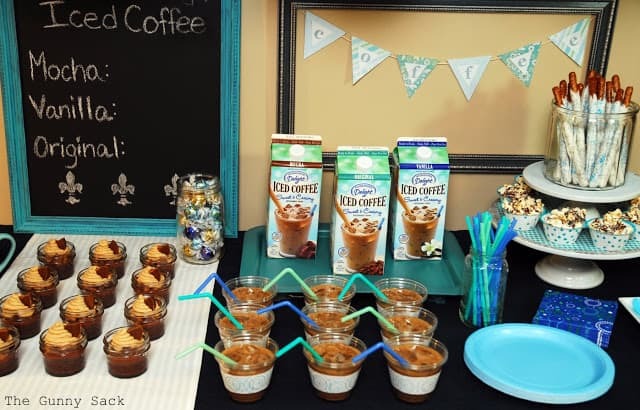 Over on the far left are coffee cups with chalkboard paint that my teen painted with my youngest sister, in case anyone wanted hot coffee too. I purchase the cups from a dollar store and the girls put masking tape around the cups before painting several layers of chalkboard paint. We also filled a jar with different flavors of Lindor Truffles. 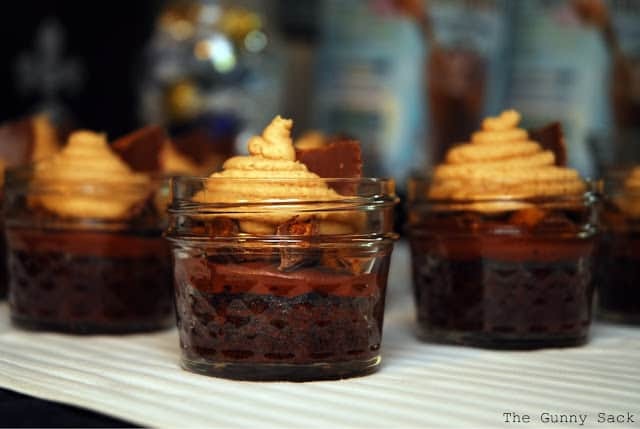 These little Peanut Butter Cup Brownies In A Jar were a big hit. In these little jars are brownies on the bottom, chocolate frosting next, peanut butter cups on top of that and peanut butter frosting on the top! I will post the recipe tomorrow! 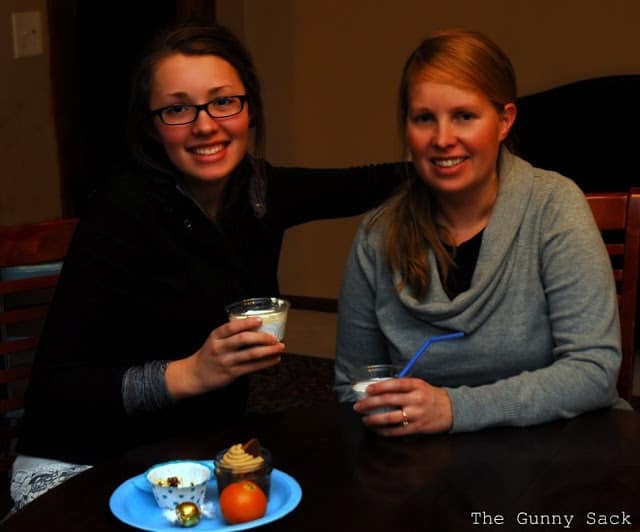 Here I am with my daughter Christine. We are both enjoying our favorite flavors: mocha for me and vanilla for her. This is the final tally on the chalkboard. 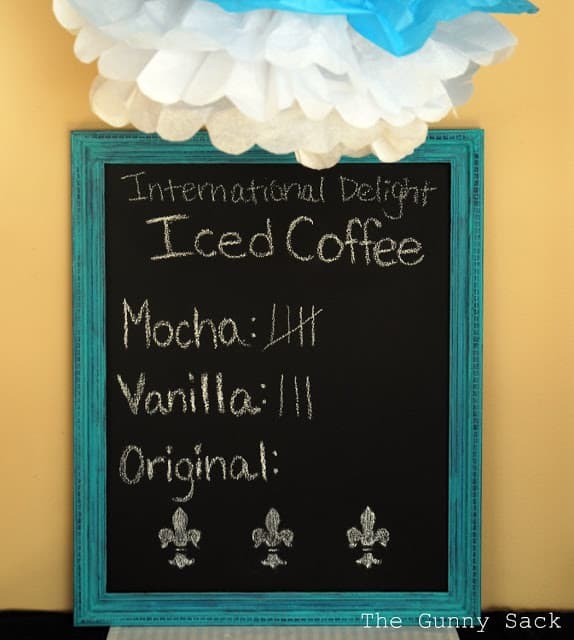 Mocha International Delight Iced Coffee was the winner! 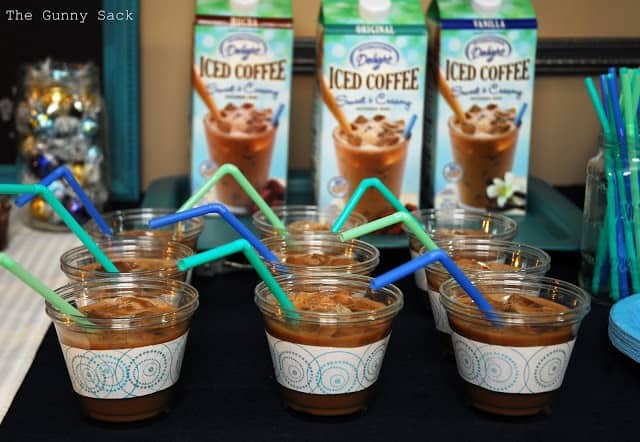 Everyone thought the iced coffee was so delicious. One of my sisters said that the mocha flavor tasted like dessert! A few are hoping for a sugar free or low sugar version to come out next! We ended up playing only one game and spent the rest of the time gabbing but what more can you expect from a group of girlfriends, right? This shop has been compensated as part of a social shopper insights study for Collective Bias #CBias but all pictures, ideas and opinions are my own. « So You Think You’re A Photographer Because You Own A DSLR? Love it! your ideas and photos are amazing. Wow! What a gorgeous party! You had so much attention to detail! I love it! Wow, what a COOL party! Your quite the hostess. I want to come to one of your gatherings, hehe. 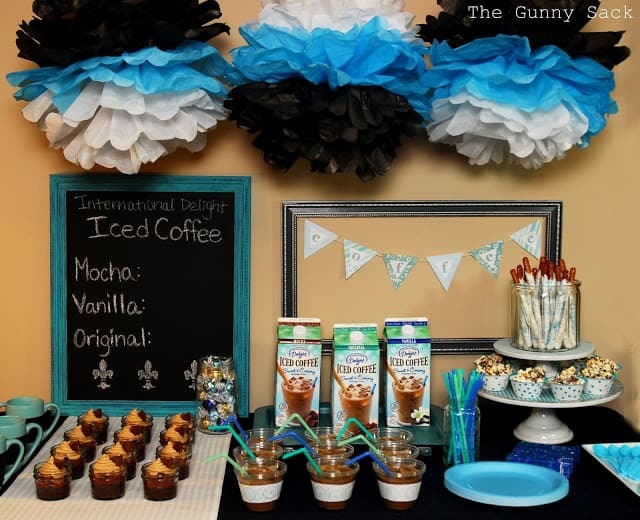 CUTE party – oh my you had the International Delight coffee and those brownies! Decadence! I love those coffees (Maggie sent me some!)! p.s. my walmart didn’t sell them either. I sorta freaked out. But thankfully found them in a different town. Oh my goodness, this sounds like my perfect kind of party!! I LOVE coffee 🙂 You did such a cute job with everything! How cute!!! I love the theme and those PB cup brownies!!! yummy!!! What a fun party! I love all the blue and white food and decorations! Wow, you are amazing! I LOVE this adorable set-up! Great job making it so fun & unique! 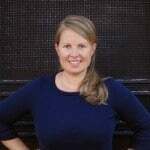 I just awarded you the Versatile Blogger award. Ummmm…. your posts always amaze me. Your details are astounding! Where do you find the time? And how in the heck can she be your daughter! That doesn’t seem possible at all. She has to be your sister! You must have been five years old when she was born. That’s disturbing, but it looks like it! Why thank you very much Alicia! I don’t have your email so I can’t reply that way but I wanted to say that people often think she in my sister. I’ve always looked young plus I’m short…LOL! Once when Christine was in middle school, I had to sign her in at the office because she was late, they tried to give me a pass for class along with her!!! Christine passed me up in height awhile ago and my tween, Vanessa, is catching up fast! Two: Why wasn’t I invited?!! Looks so good. I’m off to make myself a coffee. this is the cutest party ever!!! wish I had been there!!! thanks for all your patience!!! Yeah mocha wins by a nose! Seriously, how fun. I am constantly amazed at all the creativity. I love it! So cute!!! HOW CUTE! I loved that invitation and all the special details…great job!